Each function is achieved within a dedicated area on the focal plane. 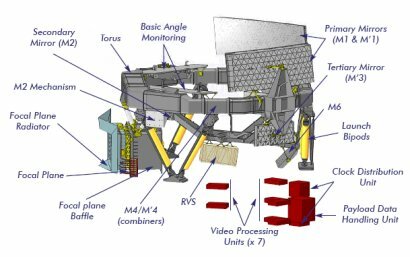 Afocal elements are located close to the focal plane for the photometric and spectroscopic functions, providing dispersion of the star's spectrum along the scan. This allows both functions to take benefit from the two viewing directions and from the large ASTRO aperture, and to operate in densely populated sky areas. RVS is implemented as a grating plate, combined with four prismatic spherical lenses. This allows the necessary dispersion value to be met while correcting most of the telescope aberrations.